The monthly calendar. I am sure all families have one – and they take lots of different forms. Years ago when I started the family calendar in the office (a big white board calendar where I write down different events/appointments), I had no idea that it would be something the girls would look forward to each and every month. At the end of the month, they start asking me when I am going to do the calendar for the next month. They always want to help also – I write the appointments and events down in different colors – and will draw little pictures when it is really a special day (like their birthdays). I love working on it when they are in bed – so when they see it the next morning, they are super excited. I guess I never really thought about it – but it tells them what they have to look forward to for the entire month. I often find them in the office studying the calendar – which I never do, since my phone tells me exactly where I need to be at all times. Good thing for technology… This month is exceptionally busy – in fact this week, we had something going on every night. Ugh. Am I ever going to be able to cook again?? A while ago I posted these…and it has taken me all this time to show you what they were used for. Yes, life is really that busy. Every year my temple has an auction, and for the past several years, I have offered to bake something for the Dessert Dash. The first year I really went crazy – and made a Tower of Treats – it took me a few weekends to make all of the treats for that special tower. After that, I tried to find something very fancy, but that was doable in one day. This year I did it – not only did it only take one day – I swear it only took a couple of hours. I remember actually sitting down that Saturday…that may have been the last Saturday I did indeed sit before going to bed. I knew I was going to make the chocolate-almond toffee – but I was looking for just the perfect dessert to go with it. The dessert I was trying to find was this amazing chocolate caramel pie that we had at Mama’s Fish House in Maui – I swear it was one of the best desserts I have ever had (ok, I have had a lot of really good desserts – but this definitely ranks high). I found this recipe in Bon Appetit, and although it wasn’t completely the same – it sounded delicious. 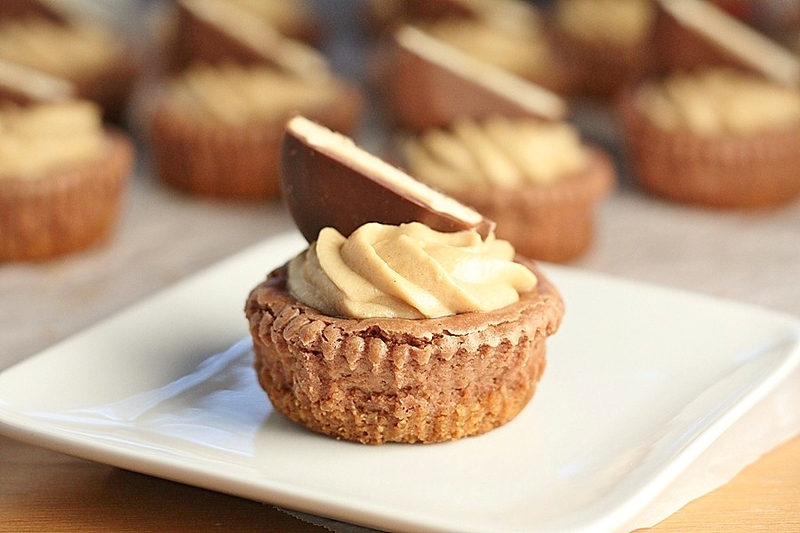 The caramel came out beautifully – and that chocolate over the top – WOW. I really wished I was going to the auction so I could buy this baby. Unfortunately I don’t know the lucky people who ended up with this – but I am sure it was worth it. Let’s hope anyway… So – if you are as busy as I am this month, but need to make something really special – here it is. Hey – Mother’s Day is coming up – what a perfect excuse! Position rack in center of oven; preheat to 375°F. Butter 9-inch tart pan with removable bottom. Blend flour, sugar, and salt in processor. Add 1/2 cup butter; process until mixture resembles coarse meal. Add egg yolks; process until moist clumps form. Press dough onto bottom and up sides of prepared pan. Bake until crust is golden brown, about 20 minutes. Cool in pan on rack while preparing caramel filling. Combine sugar and 1/4 cup water in heavy medium saucepan. Stir over medium-low heat until sugar dissolves. Increase heat to high and boil without stirring until mixture is deep amber, occasionally brushing down sides of pan with wet pastry brush and swirling pan, about 7 minutes. Remove from heat; add cream (mixture will bubble vigorously). Add butter and stir over low heat until caramel is completely smooth. Scrape in seeds from vanilla bean; stir in salt. Cool 10 minutes. Pour warm caramel into crust. Let stand at room temperature until completely cool, about 45 minutes. Bring cream to simmer in small saucepan. Remove from heat; add chocolate. Whisk until smooth. Let stand until slightly cooled but still pourable, about 10 minutes. 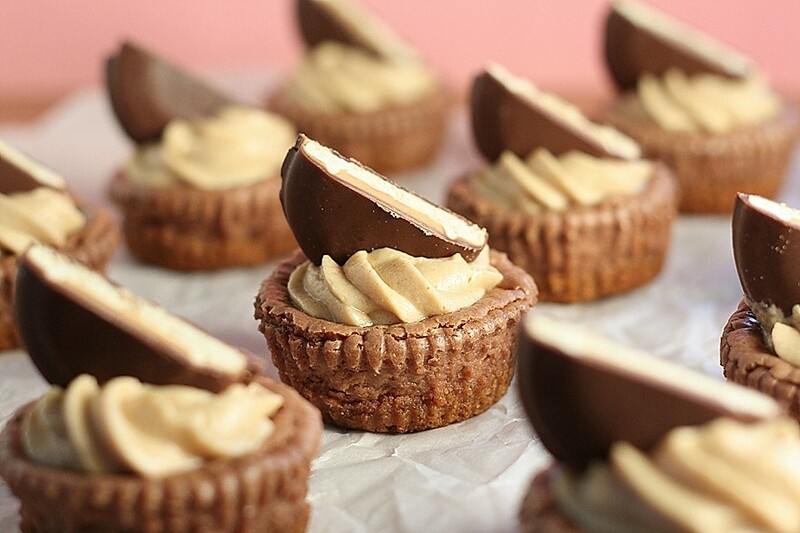 Pour ganache evenly over caramel filling. 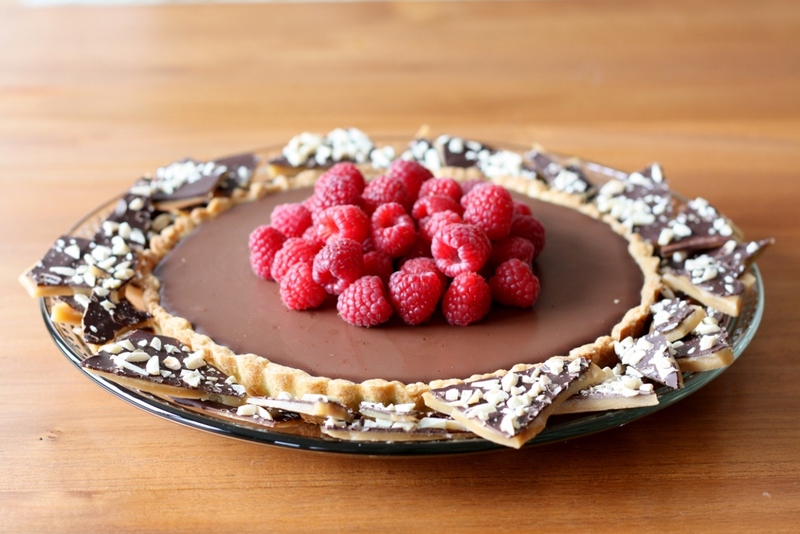 Refrigerate tart uncovered until chocolate is firm, about 2 hours. Do ahead: Can be made 2 days ahead. Cover and refrigerate. 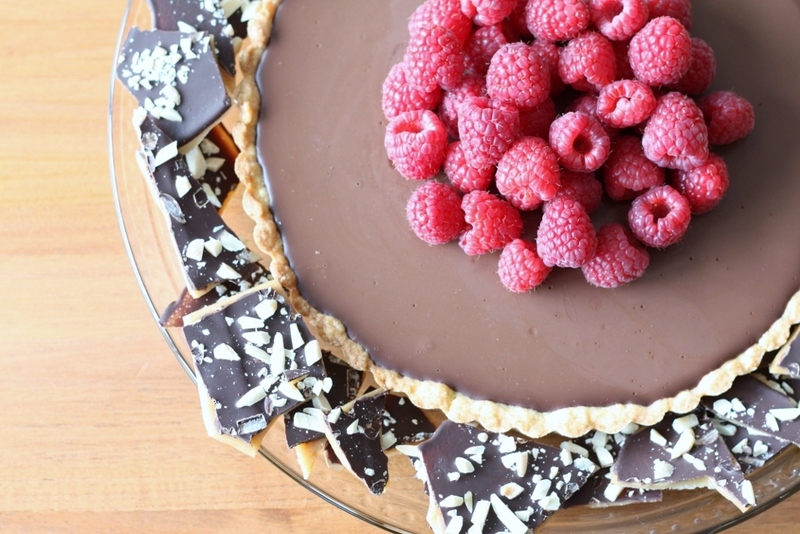 Top with raspberries before serving. Today we had a magnificent lunch – and my parents have gotten to know the Directeur of the restaurant. He told us today that he loves cookies and brownies – and in particular, he loves a good pumpkin pie. With all of the amazing pastries in Paris, it is hard to believe that someone would rather have a good cookie or brownie – if you ask me, I would vow to never eat those again, if I could have pain au sucre and tarte au fraises outside my front door whenever I wanted. He told us there is nothing better than a nice chocolate cookie with some coffee in the morning. I guess the grass is always greener on the other side. I know the grass is greener on their side. The other week I decided that I would try and make something homemade each weekend that I could easily pack in the girls lunches for treats. The packaged treats are garbage – and if you are going to eat a cookie, why not make it good with real ingredients? 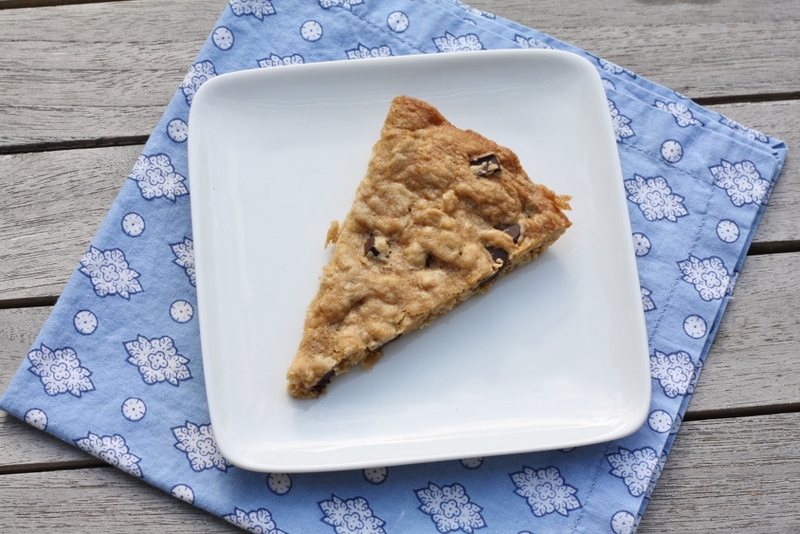 I found this recipe in Cooking Light – and it went with my whole simplicity theme – making cookies in a pie pan instead of individually – brilliant!! 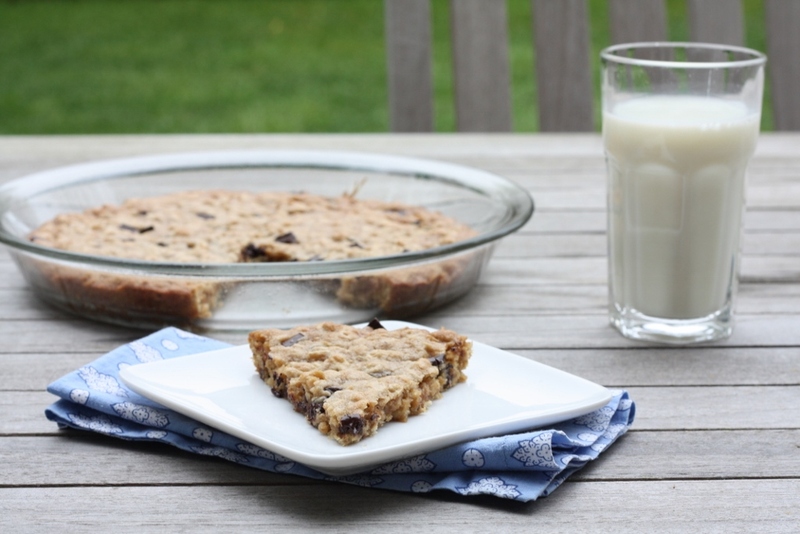 I have had skillet cookies before (wow…) but have never thought to make them like this to store. The girls LOVED them, and they lasted the entire week, and still tasted good. So – these are not Paris pastries, but as I go back to my real life – this is what we are stuck with for now. Seriously though, things could be a lot worse…and then again, there is always Paris to look forward to in the future. Combine first 7 ingredients in a large bowl; stir until well combined. Weigh or lightly spoon flour into a dry measuring cup; level with a knife. Add flour, oats, nuts, and chocolate chips to sugar mixture; stir until just combined. Scrape the dough into a 9-inch glass pie plate coated with cooking spray, and spread to edges using a spatula. Bake at 350° for 13 minutes or until set. Cool slightly on a wire rack. Cut into 8 wedges. When I studied in France many years ago – I was enamored by the Patisseries. This was over twenty years ago, when the dollar was very strong – and it cost less than a dollar for a beautiful looking éclair – or a tarte au fraise, one of my older daughter’s favorites. So – every week I would treat myself to a different pastry in the shops – I wanted to make sure I was able to try each and every one by the time I left. I actually think I came pretty close. Still – the one that I kept coming back to was the éclairs. There were a few different varieties, but it didn’t matter to me – it was not the filling that I craved, it was the pastry. It was not sweet, and the outside was just slightly crisp, while the inside was soft and egg-like. Just amazing. Now when I visit France, I am still just as enthralled with the Patisseries, but the pastries cost much more than a dollar – and now it is my daughter who is on a mission to try as many as she can. I usually just get a couple of bites of whatever she chooses – which is fine by me – there is so much good food to eat in Paris – I have to save room for everything. She is definitely into the éclairs as well – and would you believe, we actually have a favorite spot? It is on the Isle St. Louis, and their chocolate éclairs are the best I have had. 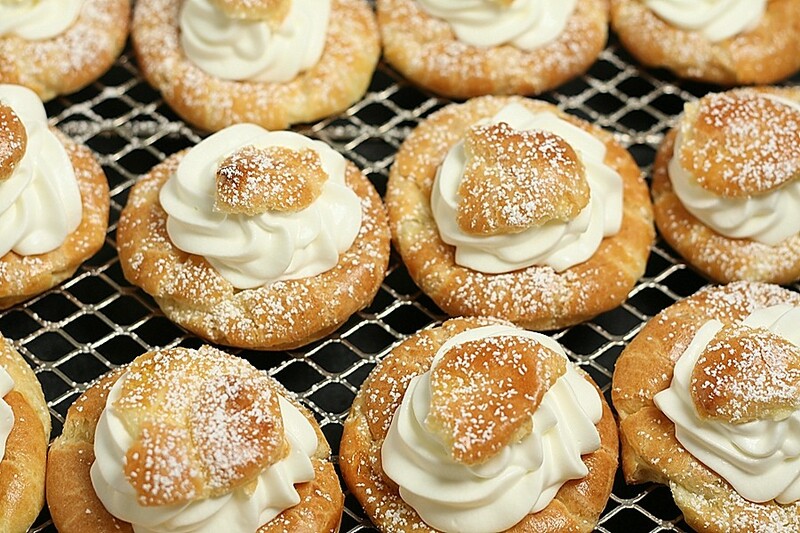 They serve them fresh and cold, and the filling is just as bit as delicious as the pastry. I am not sure why it has taken me so many years to make these – but for some reason it has. I saw this recipe in Bon Appetit, and decided it was finally time. I have a friend who thinks these are a snap to make – she whips them up all the time – well, she must have some seriously strong arms. That was the hardest part – mixing in all those eggs. Once I got past that part – the rest was pretty easy. I may have taken them out of the oven a little too soon, because mine deflated slightly – but it didn’t matter a bit. They were amazingly delicious, I was smiling from ear to ear. So – the next time I need a little taste of France, I guess I can just whip these up – pretty soon I will have monster arms too…then maybe I could fly myself to France and get the real thing? Good thing I have another trip planned. Bring milk, butter, 1 tsp. sugar, salt, and 1/2 cup water to a boil in a medium sauce-pan over medium heat, stirring occasionally. Add flour all at once; reduce heat to medium-low. Stir vigorously with a wooden spoon until a dough forms and pulls away from sides of pan, 1–2 minutes. Continue beating vigorously until a thin dry film forms on bottom and sides of pot, about 1 minute. Transfer to a bowl. Spoon dough into prepared pastry bag; pipe out 2 1/2-inch-diameter rounds on prepared sheets, leaving 2 inches between rounds. DO AHEAD: Freeze the piped dough rounds on the baking sheets, then transfer to resealable plastic bags and freeze for up to 1 month. Place on parchment paper-lined baking sheets, spacing apart (do not defrost) before continuing with recipe. It is almost that time again…that time we all love…yes, Girl Scout Cookie season!! It is definitely one of the highlights of winter. A few weeks ago, a woman on my team (who just happens to be a Girl Scout Troop Leader) told me about this recipe contest that the Girl Scouts of Western Washington were holding. I gave it a quick glance, but thought of all the things going on in my life right now, and politely declined. Well, she didn’t give up that easily – and pretty soon recipes started floating around in my head. I couldn’t get them out, they were haunting me. I knew what I had to do. My first thought was Thin Mints, everyone’s favorite – but I just couldn’t come up with anything that original. Then I moved onto Peanut Butter. There were two cookies of that variety, and I decided I had to come up with something that had both. I was inspired by this blog, but decided to go the cheesecake route. I finally decided on a chocolate cheesecake with a Do-Si-Dos crust – but then I needed some type of ganache or frosting on top, so I could put 1/2 Tagalong cookie on top. I settled on a cream cheese peanut butter ganache. I brought them to a Super Bowl party tonight, and they were a hit. The best quote of the night was “I feel like I am biting into a giant Tagalong cookie.” He was right – as soon as I tried one, that was exactly my feeling as well. So – right now I am hoping to be a finalist. If I am, I would like to do something I have never done with my blog before. If I win the grand prize, I would like to donate the money to a charity – and I am going to ask you – my readers – to choose the charity. That’s right – so stayed tuned for more on that – no sense in giving more details if I am not a finalist. I will be keeping my fingers crossed – but in the meantime, Angie – these are for you – and there will be plenty to taste at work tomorrow! For everyone else – Girl Scout Cookies are on sale from March 2nd to the 18th – and they have even created a cookie locator, as well as an app, that tells you exactly where girls are selling cookies in your neighborhood – so then you too can support your local Girl Scouts!! Pre-heat the oven to 300 degrees F. Line standard muffin tins with cupcake liners. Place Do-si-dos in a food processor and blend until the mixture resembles fine crumbs. Mix with 1/4 cup of melted butter to make a crust. Press 1 scant tablespoon of crumbs into the bottom of each cup. Press down using the back of a wooden spoon. Bake for 6-8 minutes, or until lightly browned. Let cool. Stir together the cocoa and rest of the melted butter (1/4 cup). Beat cream cheese until fluffy. Add the cocoa and butter mixture. Gradually mix in the sweetened condensed milk. Lightly mix the egg and vanilla, then add to the cream cheese mixture until combined well. Spoon into the cups (about 3/4 full). Bake 30 – 35 minutes, or until set. Cool. 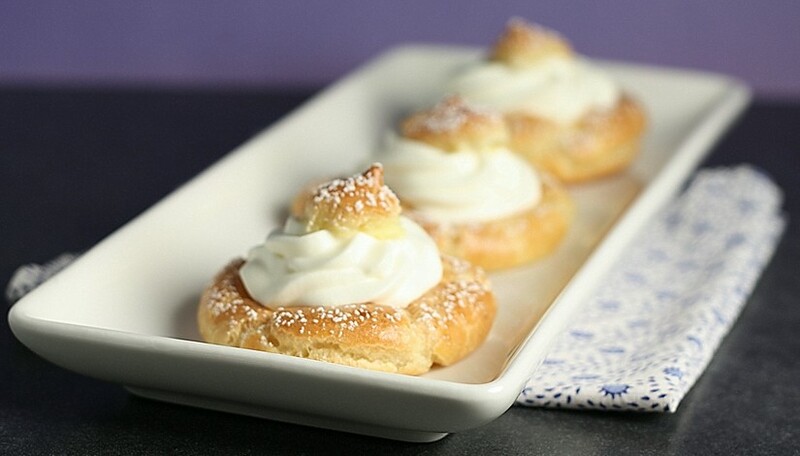 Beat cream cheese and confectioners’ sugar with a mixer on medium speed. Add salt, then peanut butter, then vanilla. Add the cream and blend well. Chill the mixture in the refrigerator for about an hour. Once the cheesecakes are completely cooled, pipe the ganache onto the cheesecakes, leaving a nice border around the edge. Place a Tagalong cookie (that has been cut in half) in the center. Keep the cheesecakes chilled until ready to serve. Happy Thanksgiving everyone!! What a day – I hope everyone ate very well today, I know I did. I actually didn’t feel like I cooked that much, I had lots of helpers – including my husband who made an incredible smoked turkey on the Big Green Egg. I can’t wait for leftovers tomorrow. So – what did I make for Thanksgiving? Pretty much the usual – and like I said, I had a lot of help. My mother baked a pie and made the stuffing and gravy, my sister brought cheese from LA, my friends brought the vegetables and a delicious chocolate pecan pie, and I filled in the rest – mashed potatoes, apple pie, pumpkin bread, and don’t forget about the pre-dinner cocktails. 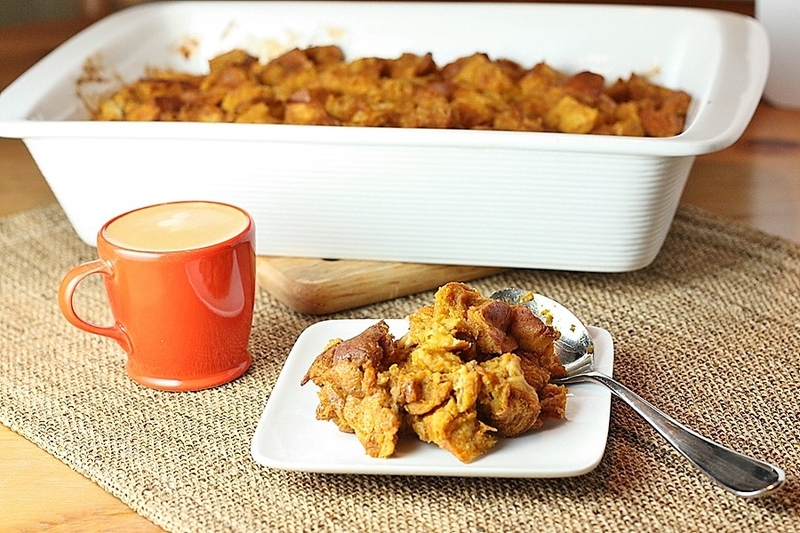 I did make something different last night though for dessert – something I hadn’t made in a long time (at least a couple of years) – pumpkin bread pudding. I remember making this and absolutely loving it – not only was it easy, it tasted like you slaved over it all day, and boy was it creamy and delicious. Since I have a house full of people to feed, I figured it was time again. Everyone loved it – and again, it was so easy – it baked while we ate dinner, and was warmed when I served it. Even though pumpkin season is basically over, you can make an exception for this one. I hope everyone had a marvelous day celebrating whatever you are thankful for – I am thankful for my family and friends, the people I work with everyday, and for food – because if it wasn’t for that, I wouldn’t be sitting here writing tonight…and you wouldn’t be reading this right now. Years ago I had an idea…I should open a store where I sell different types of cookies, and different flavors of ice-cream, and you can choose the top, bottom, and insides of your custom ice-cream sandwich. I thought it was brilliant, but I wasn’t about to quit my day job, so it just ended up being a fantasy. Over the years, I have seen glimpses of this idea come to fruition – but nothing exactly like it until my last trip to New York City. New York City is a food lovers mecca – and I have to go every year to get my fix. I love spending weeks figuring out exactly where we are going to eat, and carefully planning each meal. This last trip went extremely well, I am not sure we had a bad dish all week – and we even stumbled upon some bonus places that we were not anticipating (Eataly being one that is not to be missed). A week before we were leaving, I heard about The Meatball Shop – and even though I didn’t have a meal to spare – once I read about this place, I had to switch some things around. We had to go…and we were so glad we did. 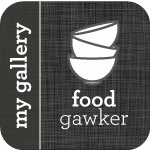 The meatballs were amazing, seriously, the best I have ever had – but get the dessert – exactly my store. They had 6 different cookies, 6 different ice-creams, and you chose the top and bottom cookie, then your ice-cream – and you have created your very own creation. For $4, it could not be beat. The entire week we were thinking about how we could go back. I saw this recipe in Cooking Light, and I really felt like they were thinking outside the box with this one. 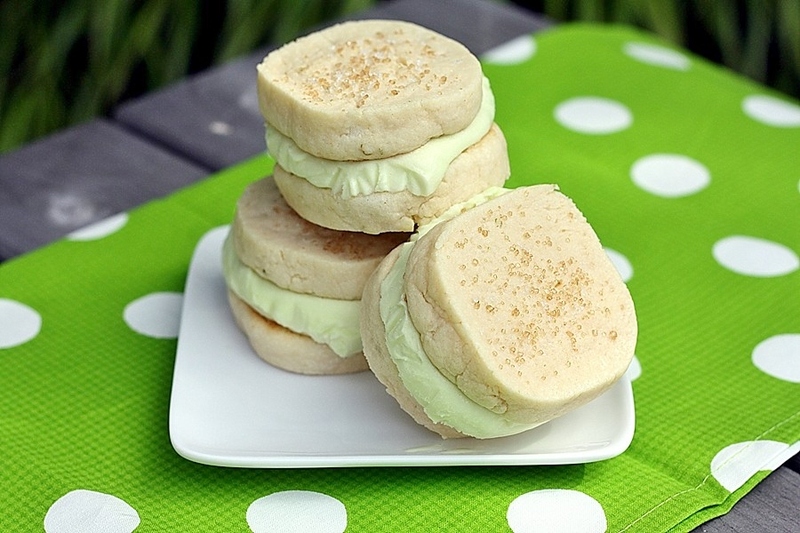 I loved the salted sugar cookies along with the lime sherbet mixed with vanilla ice-cream – it was genius. The flavors were perfect together, and if you closed your eyes, you thought you were drinking a margarita. My daughter on the other hand, was not too excited when she bit into the cookie and realized that it was not just sugar on top, it was also salt. She was not pleased. But for adults who love that combination, it cannot be beat. So – if you can’t get to NYC anytime soon, and you are craving a creative ice-cream sandwich, here is a great one for you – although it might just be too good for kids…they need to acquire the taste first. Place butter and sugar in a large bowl; beat with a mixer at medium speed for 5 minutes or until light and fluffy. 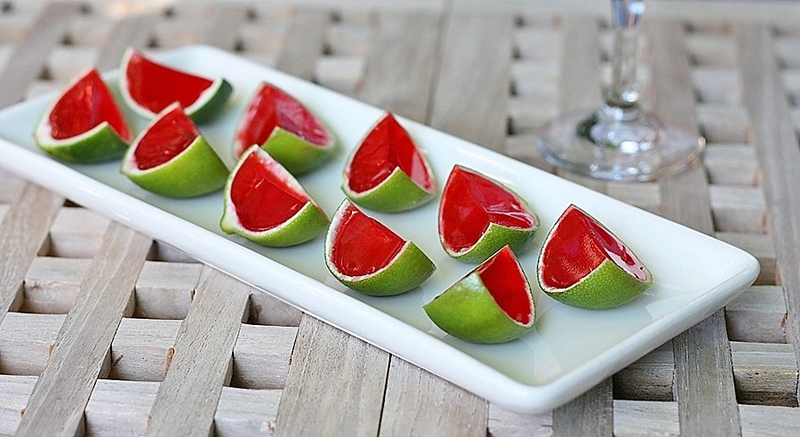 Add egg, 1 tablespoon lime rind, and lime juice; beat 2 minutes or until well combined. Weigh or lightly spoon flour into dry measuring cups; level with a knife. Combine flour, baking powder, and 1/8 teaspoon table salt; stir with a whisk. Add flour mixture to butter mixture, and beat just until combined. Divide dough into 2 equal portions. Shape each portion into a 6-inch log. Wrap logs individually in plastic wrap; chill 3 hours or until firm. Cut each log into 16 (about 1/3-inch-thick) slices, and place 1 inch apart on baking sheets lined with parchment paper. Sprinkle the cookies evenly with remaining 2 teaspoons lime rind, turbinado sugar, and sea salt. Bake at 350° for 10 minutes or until edges are lightly browned. Cool for 2 minutes on pans on a wire rack. Remove from baking sheets, and cool completely on wire rack. Place vanilla ice cream and sherbet in a medium bowl; lightly fold and swirl together. Scoop 1/4 cup ice cream mixture onto bottom of one cookie, and top with one cookie. Cover each sandwich with plastic wrap; freeze 4 hours or until firm.